Once upon a time cough medicines all contained morphine, and because morphine is a trifle addictive this was a problem. 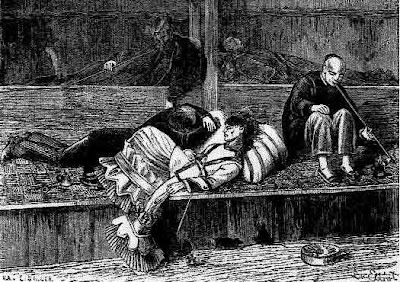 People were too worried to cure their coughs. They thought that it was better to hack a little than to become a junkie. So a German pharmaceutical company called Bayer decided to develop an alternative. They got out their primitive test tubes and rude retorts, and worked out a new chemical: diacetylmorphine, which they marketed as a "non-addictive morphine substitute". Like all new products it needed a name. Diacetylmorphine was all right if you were a scientist, but it wasn't going to work at the counter. They needed a name that would sell, a name that would make people say: "Yes! I want to buy that product!" 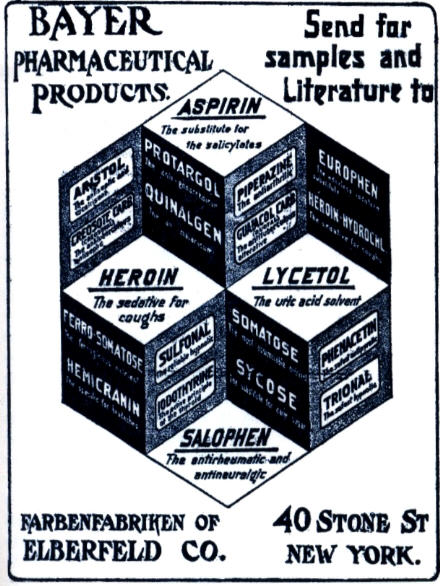 So the marketing chaps decided to call it Heroin, because apparently it made you feel heroic. And guess what? It did sell. 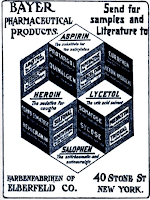 Heroin remained a Bayer trademark until the First World War; but the "non-addictive" part turned out to be a trifle misguided. Oh, and if you are ever offered "heroic measures" in hospital, it does not mean that you're going to have a tall, dashing doctor. It means that they're going to give you dangerous doses because you're probably going to die anyway. I went a-hunting Sir Urqhart, and it is my humble (well... let's just go with that for now) opinion that he made those words up. He does seem to have had a knack for it; I quite like vinomadefied, and penitissim, and disobstetricate, and also the several blogs I found while googling said words. Sir Urqhart provides shibboleths aplenty for hunting out abstruse bloggers. His particular gift appears to be ending up in the OED: did he know somebody, or were they just fellow word geeks, recognising a soul-mate across the centuries? Speaking of which, I think logofascinated is one of the most useful - although vinomadefied is up there. Apparently the Admirable Crichton (a Mary-Sue if ever I saw one) was so good at public speaking (along with everything else, of course) that one female listener became hysterical and burst a blood vessel, and another (too refined to become hysterical) fainted and appeared dead. Perhaps we could use it as a rating method for posts: logofascination factor - hysterics? fainted? burst blood vessel? aneurysm? "It means that they're going to give you dangerous doses because you're probably going to die anyway."